Myasthenia gravis (MG) is the most common neuromuscular junction disorder. It is an autoimmune disease mediated by antibody attack against the postsynaptic junctional proteins involving in the capture of acetylcholine. The patients may present with fluctuating and variable weakness of ocular, bulbar, respiratory, and limb muscles. Ptosis and diplopia caused by weakness of the extraocular muscles are the most common ocular manifestations of MG. However, this presentation of eye movement can masquerade as any cranial nerve or gaze palsy. The incidence of late-onset MG increased recently,,, and the relationship between MG and other systemic diseases has been widely investigated in the study. This article aims to update the epidemiology, background characteristics, diagnostic tests, and management of MG in Taiwan. MG could be classified into three types: ocular, bulbar, and generalized. In ocular MG, the disease affects the extraocular, levator palpebrae superioris, and orbicularis oculi muscles with pupillary sparing. Ocular muscles are more susceptible owing to the reduced complement regulation and safety factor and the simplified postsynaptic structure. About half of the patients with ocular MG become generalized within 2 years., It is more common in patients with positive acetylcholine receptor antibody (AChRAb) results. However, there is no reliable prognostic model to predict the risk of conversion till now. If the disease remains localized for more than 2 years, the likelihood of conversion to generalized MG is rare. In bulbar MG, the disease affects the muscles of mastication and causes dysphagia. For generalized MG, it generally starts by ocular symptoms and then affects the proximal limb muscles (80% occurs within 2 years and 90% occurs within 3 years). Neck weakness or bulbar weakness is a flag implies the risk of respiratory crisis. For adult patients, it usually presents with ocular symptoms initially, and then about 50% of cases develop generalized form., However, for children, 85% of patients have ocular myasthenia and <10% of cases develop generalized form., We have to avoid amblyopia due to ptosis and strabismus. In regard to the age-specific incidence, there is an early peak in the second and third decades (female predominance) and a late peak in the sixth to eighth decades (male predominance) in Caucasian populations. In contrast, the incidence rate is higher in 65–79 age group (>4.4/100,000/year) and lower in 0–19 age group (<1/100,000/year) in Taiwan. There is significantly higher incidence in females than males in age groups of 0–4 and 15–54 years. Regarding the associated diseases of MG in Taiwan, 12% of patients have thymoma. There is 2.27-fold risk of lymphoid malignancies and 118.47-fold risk of thymus cancer in MG patients. In a population-based cohort study in Taiwan, there is 1.26-fold risk of diabetes mellitus (hazard ratio [HR] =1.26, 95% confidence interval [CI] = 1.04–1.53). 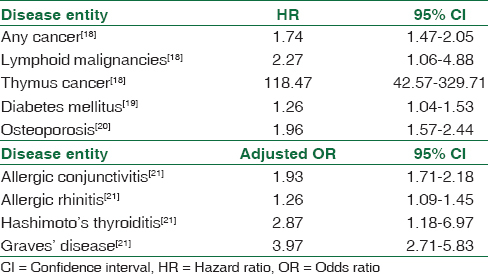 The risk is higher in patients with corticosteroids use (HR = 1.46, 95% CI = 1.15–1.86). MG is also associated with a higher risk of osteoporosis regardless of corticosteroid use (HR = 1.96, 1.52 in corticosteroid-naïve patients, 2.37 in corticosteroid-treated patients, 95% CI = 1.57–2.44, 1.11–2.08 in corticosteroid-naïve patients, 1.82–3.07 in corticosteroid-treated patients). MG is also associated with allergic conjunctivitis, allergic rhinitis, Hashimoto's thyroiditis, and Graves' disease. The relationships between the associated diseases and MG in Taiwan are summarized in [Table 2]. Double vision and ptosis are the most common symptoms of ocular MG. It is generally bilateral but could be sequential and asymmetric. Diagnosing MG could be a challenge to the ophthalmologist. Ophthalmoparesis may occur and mimic almost any pattern of ocular misalignment. Exotropia with vertical heterotropia is the most common type. The symptoms may progress in the evening and improve with rest. Comprehensive history taking could provide an important clue and raise the suspicion of MG. Enhancement of ptosis may develop on sustained upward gaze. Cogan's lid twitch is another sign of ocular MG. It means a small downward movement of an eyelid while the patient changing gazes from the downward position to the primary position. While the more ptotic eyelid is lifted by the examiner, the contralateral eyelid may become more ptotic. Pain, blurred vision, and tearing may also occur in patients with ocular MG. It is caused by incomplete blinking due to weakness of the orbicularis muscles. Dry eye syndrome is noted in 21% of ocular MG and 28% of generalized MG. Exposure keratopathy could be noted as the result of poor eyelid closure. The diagnosis of MG is based on the clinical diagnostic tests, electrophysiological studies, and antibody measures. Clinical diagnostic tests are useful in the diagnosis of ocular MG. In outpatient clinic, we can use edrophonium test (Tensilon test, intravenous injection of Tensilon), neostigmine test (intramuscular injection), ice pack test, and rest test to help us to make the diagnosis. The sensitivity of neostigmine test is 98% in generalized MG and 79% in ocular MG. However, we need to monitor the vital signs of the patients and take notice of the side effect of bradyarrhythmia. The activity of acetylcholinesterase decreased in low temperature. Therefore, the application of ice for 2 min can improve ptosis in 80% of MG patients. Rest test could also be a safe alternative. Muscle function may improve after 10–30 min of rest. These noninvasive procedures are the first choices in outpatient clinic and could avoid the possible complications of edrophonium test and neostigmine test. The electrophysiological studies include repetitive nerve stimulation and single-fiber electromyogram (EMG). Decrement on nerve stimulation in the orbicularis oculi could be noted during repetitive stimulation of the facial nerve. The sensitivity of repetitive nerve stimulation test is around 78% but the specificity is low. With single-fiber EMG, we can observe increased jitter in patients with MG. In generalized MG, we choose extensor digitorum communis as the first target. However, in ocular MG, the orbicularis oculi or frontalis may be examined first. Single-fiber EMG has much higher sensitivity (96.4%) and specificity than repetitive nerve stimulation test. In regard to antibody measurement, autoantibody to AChR has high sensitivity (80%–90%) in patients with generalized MG but only 60% in ocular MG. The use of cell-based assay with clustered AChRs significantly increase the sensitivity of AChRAb detection. The autoantibody test is the most specific test for MG; no false-positive results have been reported. However, the levels of autoantibody correlate poorly with the clinical condition. The presence of AChRAb increases the probability of developing generalized form. Antibody against muscle-specific kinase (MuSKAb) is detected in 40% of AChRAb-negative MG Caucasians  but only in 4%–12% of Taiwanese., MuSKAb is more often in female patients. Patients with positive MuSKAb tended to have more severe impairment and frequent bulbar muscles involvement, more often experienced crisis and respiratory difficulty. MuSKAbs have been reported in patients with ocular MG.,, On the other hand, antibodies to receptor-related low-density lipoprotein-4 (anti-LRP-4) is detected in 10%–40% of double-seronegative patients. Anti-LRP4 antibodies were detected in three reported cases of ocular MG.
For a patient with the suspicion of ocular MG, we could perform noninvasive clinical diagnostic tests first. Then, we usually need antibody measurement to confirm the diagnosis. Since the sensitivity of autoantibody test is lower in ocular MG, for the seronegative patients, electrophysiological studies could help us to make the final diagnosis. Single or multiple cranial neuropathy, thyroid eye disease, chronic progressive external ophthalmoplegia, and myotonic dystrophy are some differential diagnosis of ocular MG and should be ruled out when the diagnosis is uncertain. From 1970 to 1983, Woung et al. collected 197 patients with MG (78 males, 119 females) with average follow-up periods of 4.5 years in National Taiwan University Hospital. The average onset was the age of 17 in ocular MG and age of 27 in generalized MG. About 31.5% of patients were diagnosed as having MG before the age of 10. Among all the patients with MG, 54.2% had only ocular involvement. Ptosis was the most common symptoms. The involvement of extraocular muscle was the most common in lateral rectus. Regarding the diagnostic methods, 57.4% of patients were diagnosed by neostigmine test. Nearly 12.7% of them were diagnosed by Tensilon test, and 29.9% of them were diagnosed by EMG and repetitive stimulation test. Around 72.9% of patients with generalized MG transit from ocular to generalized form within 1 year of disease onset. There was another study in Southern Taiwan conducted by Hsu et al. They collected 65 patients with average follow-up time of 30.4 months. Among all the patients, 53.8% had only ocular involvement. Ptosis and diplopia were also the most common symptoms. Lateral rectus and levator muscle were the most common involving extraocular muscles. Neostigmine test was positive in 93.8% of patients. AChRAb was positive in 96.2% of generalized MG and 66.7% of ocular MG. According to the results of these two studies, the percentage of ocular MG was higher in Taiwan. However, the clinical presentation, clinical course, and sensitivity of diagnostic tests were similar to the observation in the previous studies. The treatment options of MG includes medical treatment, thymectomy, intravenous immunoglobulin (IVIG), and plasmapheresis. Regarding medical treatment, we usually start with acetylcholinesterase inhibitors, such as pyridostigmine and neostigmine. Pyridostigmine has rapid onset of action but the effects only last for 4 h. It has a better effect on ptosis than on diplopia. The common starting dose of pyridostigmine is 30 mg three times a day. The maximal dose is usually 120 mg every 4 h while awake. We should titrate the dose by its effects and adverse effects. The adverse effects of acetylcholinesterase inhibitors include increased secretions, abdominal cramps, diarrhea, sweating, nausea, and bradycardia. In one case series, pyridostigmine treatment could induce resolution of diplopia in only 6.9% of patients. Besides, it does not influence the development of generalization. If acetylcholinesterase inhibitors could not provide enough disease control or the adverse effects preclude effective dosing, we may shift to corticosteroids. Steroid can reduce the rate of generalization in several retrospective studies , and appear to be well tolerated, safe, and effective in treating ocular MG. However, there are still some debates about the risk-modifying effect of steroid. Further randomized clinical trial is indicated to clarify the effect of steroid on disease conversion. The onset of effect often begins within 2–3 weeks. The dose of prednisone can be started at 20 mg daily and then increased by 5 mg every 3–5 days to the target dose of 1.0 mg/kg/day. Once an effective response is obtained, tapering of the dose should be slow. The daily dose could be reduced by 5–10 mg each month. It could be necessary to go back to a higher dose if the symptoms recur during the taper. Thymic hyperplasia is found in 69% of seronegative MG and 88% of seropositive MG. Thymectomy is recommended for patients with thymoma. In a recent randomized control trial of patients with generalized nonthymomatous MG, the patients in the thymectomy group had lower prednisone dose and fewer requirement for immunosuppressant use. Thymectomy can decrease the need for continuing medical treatment. There is also a lower rate of progression to generalized MG and more opportunity to undergo complete remission.,,,, In the past, thymectomy was not recommended for ocular MG as the first-line treatment. It should be considered if medical treatment has failed. However, the minimally invasive procedures such as robotic surgery make thymectomy a more acceptable therapeutic option for patients with ocular MG.
IVIG is indicated in acute exacerbations including myasthenic crisis or the perioperative period of thymectomy. It accelerates the catabolism of immunoglobulin G, suppresses the antibody production, and neutralizes autoantibodies., About 70% of patients have improvement of symptoms with IVIG. Double-filtration plasmapheresis is another treatment option to reverse an exacerbation of myasthenia. It modulates cellular immunity, decreases natural killer cell cytotoxicity., Besides, it is effective for AChRAb or MuSKAb removal and amelioration of muscle weakness., Both IVIG and plasmapheresis are reserved for refractory MG and seldom used in ocular MG.
Surgical correction can be performed for stable ptosis. However, the degree of ptosis should be stable for 3–4 years before repair., Otherwise, the recurrence of ptosis could develop as the nature of myasthenia. Since the levator muscle function is usually fluctuating, the choice of levator muscle resection may cause under correction and require repeat surgery. Frontalis slings are the alternative method, but the surgeon needs to pay attention to the exposure-related complications. For patients presenting with diplopia, we can use prism glass or occlusion therapy. Strabismus surgery is indicated when the deviation is too large and no substantial change in the degree of deviation for at least 12 months. The patients should be informed regarding the possibility of repeat surgeries, especially in those with older age, positive AChRAb, more severe disease, or coexistent muscle restriction. Ocular MG is a localized form of MG involving the extraocular, levator palpebrae superioris, and orbicularis oculi muscles. The prevalence of MG in Taiwan is comparable to Caucasian populations. The incidence rate is higher in the elderly and the percentage of ocular MG was higher in Taiwan. The clinical manifestations include diplopia and ptosis. Ice pack test, rest test, Tensilon/neostigmine test, circulating antibody measurement, and electrophysiological studies could help the ophthalmologist to make the diagnosis. For the patients with ocular MG, acetylcholinesterase inhibitors are usually considered as the first-line treatment. Corticosteroids and immunosuppressant should be used in patients with poor disease control. The ophthalmologists must decide the sequence of treatment based on the level of disease activity and patient tolerability. Surgical correction of ptosis and strabismus could be performed while the condition is stable for a long time. Vaphiades MS, Bhatti MT, Lesser RL. Ocular myasthenia gravis. Curr Opin Ophthalmol 2012;23:537-42. Somnier FE. Increasing incidence of late-onset anti-AChR antibody- seropositive myasthenia gravis. Neurology 2005;65:928-30. Matsuda M, Dohi-Iijima N, Nakamura A, Sekijima Y, Morita H, Matsuzawa S, et al. Increase in incidence of elderly-onset patients with myasthenia gravis in Nagano Prefecture, Japan. Intern Med 2005;44:572-7. Pakzad Z, Aziz T, Oger J. Increasing incidence of myasthenia gravis among elderly in British Columbia, Canada. Neurology 2011;76:1526-8. Serra A, Ruff R, Kaminski H, Leigh RJ. Factors contributing to failure of neuromuscular transmission in myasthenia gravis and the special case of the extraocular muscles. Ann N Y Acad Sci 2011;1233:26-33. Bever CT Jr., Aquino AV, Penn AS, Lovelace RE, Rowland LP. Prognosis of ocular myasthenia. Ann Neurol 1983;14:516-9. Grob D, Brunner N, Namba T, Pagala M. Lifetime course of myasthenia gravis. Muscle Nerve 2008;37:141-9. Oger J, Frykman H. An update on laboratory diagnosis in myasthenia gravis. Clin Chim Acta 2015;449:43-8. Lai CH, Tseng HF. Nationwide population-based epidemiological study of myasthenia gravis in Taiwan. Neuroepidemiology 2010;35:66-71. Wang HS. Myasthenia gravis: Generalized vs. ocular, and children vs. adults. Arch Neurol 2003;60:1491. Cetin H, Fülöp G, Zach H, Auff E, Zimprich F. Epidemiology of myasthenia gravis in Austria: Rising prevalence in an ageing society. Wien Klin Wochenschr 2012;124:763-8. Boldingh MI, Maniaol AH, Brunborg C, Dekker L, Heldal AT, Lipka AF, et al. Geographical distribution of myasthenia gravis in Northern Europe – Results from a population-based study from two countries. Neuroepidemiology 2015;44:221-31. Breiner A, Widdifield J, Katzberg HD, Barnett C, Bril V, Tu K. Epidemiology of myasthenia gravis in Ontario, Canada. Neuromuscul Disord 2016;26:41-6. Santos E, Coutinho E, Moreira I, Silva AM, Lopes D, Costa H, et al. Epidemiology of myasthenia gravis in Northern Portugal: Frequency estimates and clinical epidemiological distribution of cases. Muscle Nerve 2016;54:413-21. Thanvi BR, Lo TC. Update on myasthenia gravis. Postgrad Med J 2004;80:690-700. Yeh JH, Lin CC, Chen YK, Sung FC, Chiu HC, Kao CH. Excessive risk of cancer and in particular lymphoid malignancy in myasthenia gravis patients: A population-based cohort study. Neuromuscul Disord 2014;24:245-9. Yeh JH, Chen HJ, Lin CC, Chen YK, Chiu HC, Kao CH, et al. Risk of diabetes mellitus among patients with myasthenia gravis. Acta Neurol Scand 2015;132:132-8. Yeh JH, Chen HJ, Chen YK, Chiu HC, Kao CH. Increased risk of osteoporosis in patients with myasthenia gravis: A population-based cohort study. Neurology 2014;83:1075-9. Yeh JH, Kuo HT, Chen HJ, Chen YK, Chiu HC, Kao CH. Higher risk of myasthenia gravis in patients with thyroid and allergic diseases: A national population-based study. Medicine (Baltimore) 2015;94:e835. Woung LC, Chou WY, Ko LS, Chiu HC. Ocular Manifestations of Myasthenia Gravis. Acta Soc Ophthalmologicae Sinicae 1985;2:325-34. Roh HS, Lee SY, Yoon JS. Comparison of clinical manifestations between patients with ocular myasthenia gravis and generalized myasthenia gravis. Korean J Ophthalmol 2011;25:1-7. Golnik KC, Pena R, Lee AG, Eggenberger ER. An ice test for the diagnosis of myasthenia gravis. Ophthalmology 1999;106:1282-6. Odel JG, Winterkorn JM, Behrens MM. The sleep test for myasthenia gravis. A safe alternative to Tensilon. J Clin Neuroophthalmol 1991;11:288-92. Zambelis T, Kokotis P, Karandreas N. Repetitive nerve stimulation of facial and hypothenar muscles: Relative sensitivity in different myasthenia gravis subgroups. Eur Neurol 2011;65:203-7. Sarrigiannis PG, Kennett RP, Read S, Farrugia ME. Single-fiber EMG with a concentric needle electrode: Validation in myasthenia gravis. Muscle Nerve 2006;33:61-5. Lindstrom JM, Seybold ME, Lennon VA, Whittingham S, Duane DD. Antibody to acetylcholine receptor in myasthenia gravis. Prevalence, clinical correlates, and diagnostic value. Neurology 1976;26:1054-9. Jacob S, Viegas S, Leite MI, Webster R, Cossins J, Kennett R, et al. Presence and pathogenic relevance of antibodies to clustered acetylcholine receptor in ocular and generalized myasthenia gravis. Arch Neurol 2012;69:994-1001. Somnier FE. Clinical implementation of anti-acetylcholine receptor antibodies. J Neurol Neurosurg Psychiatry 1993;56:496-504. Plested CP, Tang T, Spreadbury I, Littleton ET, Kishore U, Vincent A. AChR phosphorylation and indirect inhibition of AChR function in seronegative MG. Neurology 2002;59:1682-8. Evoli A, Tonali PA, Padua L, Monaco ML, Scuderi F, Batocchi AP, et al. Clinical correlates with anti-MuSK antibodies in generalized seronegative myasthenia gravis. Brain 2003;126(Pt 10):2304-11. Yeh JH, Chen WH, Chiu HC, Vincent A. Low frequency of MuSK antibody in generalized seronegative myasthenia gravis among Chinese. Neurology 2004;62:2131-2. Huang YC, Yeh JH, Chiu HC, Chen WH. Clinical characteristics of MuSK antibody-positive myasthenia gravis in Taiwan. J Formos Med Assoc 2008;107:572-5. Caress JB, Hunt CH, Batish SD. Anti-MuSK myasthenia gravis presenting with purely ocular findings. Arch Neurol 2005;62:1002-3. Hanisch F, Eger K, Zierz S. MuSK-antibody positive pure ocular myasthenia gravis. J Neurol 2006;253:659-60. Bennett DL, Mills KR, Riordan-Eva P, Barnes PR, Rose MR. Anti-MuSK antibodies in a case of ocular myasthenia gravis. J Neurol Neurosurg Psychiatry 2006;77:564-5. Zisimopoulou P, Evangelakou P, Tzartos J, Lazaridis K, Zouvelou V, Mantegazza R, et al. A comprehensive analysis of the epidemiology and clinical characteristics of anti-LRP4 in myasthenia gravis. J Autoimmun 2014;52:139-45. Hsu SY, Tsai RK, Wang HZ, Su MY. A comparative study of ocular and generalized myasthenia gravis. Kaohsiung J Med Sci 2002;18:62-9. Kerty E, Elsais A, Argov Z, Evoli A, Gilhus NE. EFNS/ENS Guidelines for the treatment of ocular myasthenia. Eur J Neurol 2014;21:687-93. Kupersmith MJ, Ying G. Ocular motor dysfunction and ptosis in ocular myasthenia gravis: Effects of treatment. Br J Ophthalmol 2005;89:1330-4. Monsul NT, Patwa HS, Knorr AM, Lesser RL, Goldstein JM. The effect of prednisone on the progression from ocular to generalized myasthenia gravis. J Neurol Sci 2004;217:131-3. Benatar M, Kaminski H. Medical and surgical treatment for ocular myasthenia. Cochrane Database Syst Rev 2006:CD005081. Benatar M, Mcdermott MP, Sanders DB, Wolfe GI, Barohn RJ, Nowak RJ, et al. Efficacy of prednisone for the treatment of ocular myasthenia (EPITOME): A randomized, controlled trial. Muscle Nerve 2016;53:363-9. Seybold ME, Drachman DB. Gradually increasing doses of prednisone in myasthenia gravis. Reducing the hazards of treatment. N Engl J Med 1974;290:81-4. Richman DP, Agius MA. Myasthenia gravis: Pathogenesis and treatment. Semin Neurol 1994;14:106-10. Kupersmith MJ, Latkany R, Homel P. Development of generalized disease at 2 years in patients with ocular myasthenia gravis. Arch Neurol 2003;60:243-8. Benatar M, Kaminski HJ; Quality Standards Subcommittee of the American Academy of Neurology. Evidence report: The medical treatment of ocular myasthenia (an evidence-based review): Report of the Quality Standards Subcommittee of the American Academy of Neurology. Neurology 2007;68:2144-9. Allen JA, Scala S, Jones HR. Ocular myasthenia gravis in a senior population: Diagnosis, therapy, and prognosis. Muscle Nerve 2010;41:379-84. Palace J, Newsom-Davis J, Lecky B. A randomized double-blind trial of prednisolone alone or with azathioprine in myasthenia gravis. Myasthenia Gravis Study Group. Neurology 1998;50:1778-83. Mantegazza R, Antozzi C, Peluchetti D, Sghirlanzoni A, Cornelio F. Azathioprine as a single drug or in combination with steroids in the treatment of myasthenia gravis. J Neurol 1988;235:449-53. Hehir MK, Burns TM, Alpers J, Conaway MR, Sawa M, Sanders DB. Mycophenolate mofetil in AChR-antibody-positive myasthenia gravis: Outcomes in 102 patients. Muscle Nerve 2010;41:593-8. Meriggioli MN, Ciafaloni E, Al-Hayk KA, Rowin J, Tucker-Lipscomb B, Massey JM, et al. Mycophenolate mofetil for myasthenia gravis: An analysis of efficacy, safety, and tolerability. Neurology 2003;61:1438-40. Sanders DB, Hart IK, Mantegazza R, Shukla SS, Siddiqi ZA, De Baets MH, et al. An international, phase III, randomized trial of mycophenolate mofetil in myasthenia gravis. Neurology 2008;71:400-6. Muscle Study Group. A trial of mycophenolate mofetil with prednisone as initial immunotherapy in myasthenia gravis. Neurology 2008;71:394-9. Tindall RS, Rollins JA, Phillips JT, Greenlee RG, Wells L, Belendiuk G. Preliminary results of a double-blind, randomized, placebo-controlled trial of cyclosporine in myasthenia gravis. N Engl J Med 1987;316:719-24. Tindall RS, Phillips JT, Rollins JA, Wells L, Hall K. A clinical therapeutic trial of cyclosporine in myasthenia gravis. Ann N Y Acad Sci 1993;681:539-51. Lavrnic D, Vujic A, Rakocevic-Stojanovic V, Stevic Z, Basta I, Pavlovic S, et al. Cyclosporine in the treatment of myasthenia gravis. Acta Neurol Scand 2005;111:247-52. Nagane Y, Utsugisawa K, Obara D, Kondoh R, Terayama Y. Efficacy of low-dose FK506 in the treatment of Myasthenia gravis – A randomized pilot study. Eur Neurol 2005;53:146-50. Yoshikawa H, Kiuchi T, Saida T, Takamori M. Randomised, double-blind, placebo-controlled study of tacrolimus in myasthenia gravis. J Neurol Neurosurg Psychiatry 2011;82:970-7. Yagi Y, Sanjo N, Yokota T, Mizusawa H. Tacrolimus monotherapy: A promising option for ocular myasthenia gravis. Eur Neurol 2013;69:344-5. Heckmann JM, Rawoot A, Bateman K, Renison R, Badri M. A single-blinded trial of methotrexate versus azathioprine as steroid-sparing agents in generalized myasthenia gravis. BMC Neurol 2011;11:97. Díaz-Manera J, Martínez-Hernández E, Querol L, Klooster R, Rojas-García R, Suárez-Calvet X, et al. Long-lasting treatment effect of rituximab in MuSK myasthenia. Neurology 2012;78:189-93. De Feo LG, Schottlender J, Martelli NA, Molfino NA. Use of intravenous pulsed cyclophosphamide in severe, generalized myasthenia gravis. Muscle Nerve 2002;26:31-6. Rowin J, Meriggioli MN, Tüzün E, Leurgans S, Christadoss P. Etanercept treatment in corticosteroid-dependent myasthenia gravis. Neurology 2004;63:2390-2. Yuan HK, Huang BS, Kung SY, Kao KP. The effectiveness of thymectomy on seronegative generalized myasthenia gravis: Comparing with seropositive cases. Acta Neurol Scand 2007;115:181-4. Schumm F, Wiethölter H, Fateh-Moghadam A, Dichgans J. Thymectomy in myasthenia with pure ocular symptoms. J Neurol Neurosurg Psychiatry 1985;48:332-7. Shrager JB, Deeb ME, Mick R, Brinster CJ, Childers HE, Marshall MB, et al. Transcervical thymectomy for myasthenia gravis achieves results comparable to thymectomy by sternotomy. Ann Thorac Surg 2002;74:320-6. Takanami I, Abiko T, Koizumi S. Therapeutic outcomes in thymectomied patients with myasthenia gravis. Ann Thorac Cardiovasc Surg 2009;15:373-7. Roberts PF, Venuta F, Rendina E, De Giacomo T, Coloni GF, Follette DM, et al. Thymectomy in the treatment of ocular myasthenia gravis. J Thorac Cardiovasc Surg 2001;122:562-8. Liu Z, Feng H, Yeung SC, Zheng Z, Liu W, Ma J, et al. Extended transsternal thymectomy for the treatment of ocular myasthenia gravis. Ann Thorac Surg 2011;92:1993-9. Gilbert ME, De Sousa EA, Savino PJ. Ocular myasthenia gravis treatment: The case against prednisone therapy and thymectomy. Arch Neurol 2007;64:1790-2. Marulli G, Schiavon M, Perissinotto E, Bugana A, Di Chiara F, Rebusso A, et al. Surgical and neurologic outcomes after robotic thymectomy in 100 consecutive patients with myasthenia gravis. J Thorac Cardiovasc Surg 2013;145:730-5. Kim JY, Park KD, Richman DP. Treatment of myasthenia gravis based on its immunopathogenesis. J Clin Neurol 2011;7:173-83. Gajdos P, Chevret S, Toyka K. Intravenous immunoglobulin for myasthenia gravis. Cochrane Database Syst Rev 2008:CD002277. Yeh JH, Chien PJ, Hsueh YM, Shih CM, Chiu HC. Changes in the lymphocyte subset after double-filtration plasmapheresis. Am J Clin Pathol 2007;128:940-4. Chien PJ, Yeh JH, Chiu HC, Hsueh YM, Chen CT, Chen MC, et al. Inhibition of peripheral blood natural killer cell cytotoxicity in patients with myasthenia gravis treated with plasmapheresis. Eur J Neurol 2011;18:1350-7. Yeh JH, Chen WH, Huang KM, Chiu HC. Prethymectomy plasmapheresis in myasthenia gravis. J Clin Apher 2005;20:217-21. Yeh JH, Chen WH, Chiu HC, Bai CH. MuSK antibody clearance during serial sessions of plasmapheresis for myasthenia gravis. J Neurol Sci 2007;263:191-3. Castronuovo S, Krohel GB, Kristan RW. Blepharoptosis in myasthenia gravis. Ann Ophthalmol 1983;15:751-4. Lai CS, Lai YW, Huang SH, Lee SS, Chang KP, Chen AD. Surgical correction of the intractable blepharoptosis in patients with ocular myasthenia gravis. Ann Plast Surg 2016;76 Suppl 1:S55-9. Bentley CR, Dawson E, Lee JP. Active management in patients with ocular manifestations of myasthenia gravis. Eye (Lond) 2001;15(Pt 1):18-22. Lee J. Management of selected forms of neurogenic strabismus. In: Rosenbaum A, Santiago A, editors. Clinical Strabismus Management: Principles and Surgical Techniques. Philadelphia: WB Saunders Company; 1999. p. 380-92. Peragallo JH, Velez FG, Demer JL, Pineles SL. Long-term follow-up of strabismus surgery for patients with ocular myasthenia gravis. J Neuroophthalmol 2013;33:40-4.